"Risk is our business. That's what the ship is all about. That's why we're aboard her." In a fairly low-key episode, Kirk (William Shatner), Spock (Leonard Nimoy), and new character Dr. Ann Mulhall (Diana Muldaur) allow their bodies to be taken over by mysterious entities to help them create humanoid robots. Once these machines are made, their brilliant minds could then control an actual physical presence in the world. Not surprisingly, complications arise aboard the Enterprise, with Kirk's life as the possible penalty for trying to help these strange beings. The story begins with an unexplained message from the depths of a supposedly dead planet and a presence known only as Sargon. This voice urges them to beam down to his chamber, where he would explain his unusual request. In an interesting scene afterwards, Kirk consults the crew and requires a unanimous decision to go along with the mind transfer. What's intriguing is the way he manipulates the crew (especially Dr. McCoy) into embarking on this dangerous venture. With words about the risk and their true duty, Kirk pushes all the right buttons and convinces them to go along with his ideas. One of the highlights of this episode is watching Shatner and Nimoy change their acting personas to match the characters who have taken over their bodies. While Sargon struggles with Kirk's body, Shatner is able to perform some hilarious overacting, complete with plenty of slow speech and bodily convulsions. Nimoy steals the show with a villainous performance that presents a greater range than is inherent in his logical Vulcan character. He connives to murder his captain with several simple and ingenious schemes that appear nearly flawless. Unfortunately, the story falters due to a slow pace that never really drew me into the action. Besides the rooms inside the planet, the entire episode takes place within the Enterprise, and this setting contributes to making it less interesting. The ideas are fairly original, and the execution is decent, but it fails to live up to the best entries in the original series. 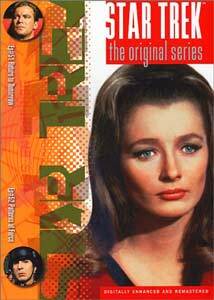 Also, Diana Muldaur is attractive, but her acting is wooden and uninspiring, even next to Shatner's laugh-inducing work. The premise has good possibilities, but the overall result is a slow-paced, mediocre episode. In a plot pulled from the 20th century, Kirk and Spock journey to a planet where an alien race has adopted the ways of Nazi Germany. This action-packed episode is one of the better Star Trek episodes I can remember within my limited knowledge of the original series. Although the story feels extremely far-fetched, it succeeds due to a surprisingly effective performance from William Shatner and several tense scenes. On a routine search for missing Federation member John Gill (David Brian) the Enterprise crew quickly realizes that much more is at stake on this planet. From the orders of their "Führer," the Ekosians are planning to exterminate the Zeons to achieve racial purity in the system. Oddly enough, there appears to be little difference between the two alien races and human beings. In fact, they all look pretty much the same except for the Nazi uniforms worn by the Ekosians. In this world, it seems that your clothes (instead of bad makeup) determines what type of alien you are. In order to infiltrate the fascist government and uncover the mystery of John Gill, Kirk and Spock must don Nazi outfits and try to act like members of this tyrannical regime. This episode contains an impressive modern tone that makes the events not appear nearly as dated as certain entries in the series. During one interrogation scene, Kirk and Spock are tortured fairly brutally (especially for this series), and the danger of death appears real and imminent. They spend much of the time narrowly avoiding serious bodily harm through sheer ingenuity and pure luck. Star Trek: The Original Series and its subsequent films work the best when they combine interesting dramatic moments with a light-hearted tone of action and excitement. All of these elements come together nicely in Patterns of Force - a decent story directed with tight precision by Vincent McEveety. William Shatner's acting is often easy to ridicule, but he does an admirable job adding emotional touches to this story. His work is subtler here, and the complexity in his decision-making allows for a greater range of interesting thoughts and ideas. Image Transfer Review: The bright purples, reds, and greens of the Enterprise interior shine on this full-frame transfer, which looks great considering the time period and original source material. Although some minor defects do arise here and there, the overall picture is impressive and provides a nice presentation of this cult television series. There are fairly grainy elements in the transfer (especially in the second episode), but they aren't a problem because of the age of the product. Audio Transfer Review: The 5.1-channel audio transfer utilizes all elements of the sound field, and this is especially evident while music plays during the opening credits and tense moments of the stories. Although the scope and force of this track is limited due to the age of the sound track, it does move nicely through the sound field and use the rear speakers efficiently. One particularly impressive moment occurs in each credits sequence as the Enterprise flies across the screen. The sounds move straight across from the front to rear speakers, and the effect, although simple, provides an enjoyable experience. Extras Review: Each episode contains well-done English subtitles and the original television trailer. Each preview lasts for about a minute, and presents the dangerous action scenes in order to draw audiences to tune in for that episode. Due to the large amount of episodes being released by Paramount, it's difficult to imagine much more in terms of extra features. I've never considered myself a Star Trek fanatic, but the films are enjoyable (with the exception of the fifth entry), and the original series works surprisingly well for the time period. This modern tone is especially evident in the second episode - Patterns of Force - which contains plenty of energetic action and a complex plot. This disc is obviously recommended for fans of the series, but would also provide a good night's entertainment for casual viewers.